When I mention the name “Stary Olsa”, what comes to mind? Do you think it’s a heavy metal band? Perhaps a girl group? Or maybe it’s a rap duo? Actually, it’s none of those above. 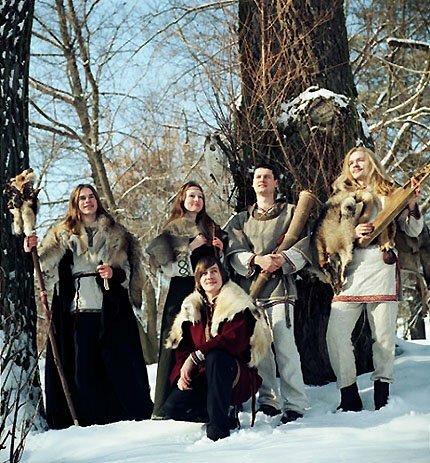 Stary Olsa (Стары Ольса) is a medieval folk band from Belarus. Yes, you are reading that right, it’s a contemporary band that plays music from the twelfth century. Doesn’t that sound remotely cool? The band, which formed in 1999, got their name from a brook in the the Mahilou Region of Western Belarus. Stary Olsa collaborates with various historical institutions and museums to create new music with long-forgotten, nearly extinct musical relics like the zurna, the gusli (a cross between a Japanese koto and a lyre), hurdy-gurdy, and others. Many members have joined and eventually left the band over the years as the current leader is the duda and gusli player Zmicier Sasnouski. The band has produced many albums over the years with their latest album, “Santa Maria”, released last year. Most of the music that is featured on the albums are “Belarusian folk balladry and martial songs, Belarusian national dances, works of Belarusian Renaissance composers, compositions from Belarusian aulic music collections, Belarusian canticles of the 16th – early 17th centuries, as well as European popular melodies of the Middle Ages and Renascence.” They also perform in medieval Belarusian fashion at many folk music festivals and flashy theatrical concerts with the folk dance group “The Javaryna Band”. When I received their best album from my Reddit Secret Santa last Christmas, I was a bit hesitate at first. I thought it would be like one of those generic classic Beethoven albums you find at Walmart or Target that features songs that have been done over and over. I didn’t think it would be a high quality album based on the cover’s simple design. But, I was wrong once I listened to it! It was pretty neat as the songs, like “Litvin”, had modern feel mixed with the old-fashioned instruments, chants, and basic lyrics about life, war, and country pride. Although, I swear there is a hint of a guitar-like beat/rhythm in the song “Litvin”, especially at the beginning. I could be wrong though. Although “Litvin” maintains a simple beat and musical structure, the lyrics are very interesting. Written in Old Belarusian, the song recounts the tales of the mighty, brave warriors that fought in numerous battles for Grand Duchy of Lithuania,. However, many Belorussians have called themselves “Litvin” recently as they think they helped to create the Grand Duchy’s rich culture. The sense of country pride is no stranger to the song “Litvin” as this sentiment is carried in the war-like rhythms, rough chants, and the music video below. You don’t need to know any Belarusian to fully understand the song’s theme, just the music. And if you enjoyed that, you might enjoy their rendition of Metallica’s “One”. No, I’m not kidding, their cover sounds amazing! Next posting will be something from Japan again! Stay tuned!